Lignetics Inc. has announced the acquisition of the assets of GF Funding LLC, formerly known as Geneva Wood Fuels, expanding its footprint into Maine and upper New England. Westervelt Renewable Energy has achieved Sustainable Biomass Partnership certification from NSF Sustainability, a division of global public health organization NSF International. The Sustainable Biomass Partnership has today announced that NSF International has become an ‘SBP-approved’ certification body. A group of companies in Kansas created Konza Renewable Fuels to focus on commercializing wood torrefaction technology five years ago and are now in the process of fabricating the equipment for their first sale. Three biomass boilers are being shipped to Haines, Alaska, with the potential to heat a variety of buildings throughout town. The boilers are expected to arrive next month and utilize either wood pellets or locally produced wood chips as a feedstock. Plans for the Teesside Renewable Energy Plant, a 40-MWe biomass cogeneration facility to be located at Port Clarence in Cramlington, Northumberland, England, continue to advance. 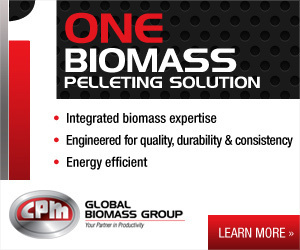 USIPA's 5th Annual Exporting Pellets Conference opened in Miami with a cautious eye on the first conservative majority in the United Kingdom in nearly 20 years, and the potential implications for the industrial wood pellet industry. Participants in the Model Neighborhood Wood Heat Initiative gathered Oct. 1 to celebrate the program’s success. So far, the program has helped install state-of-the-art, high efficiency wood pellet boilers in 23 homes and 8 non-residential buildings. The U.S. DOE is proposing a new initiative to significantly accelerate adoption of sustainable clean and energy efficiency strategies in remote rural Alaskan communities. This month, Energy Secretary Ernest Moniz announced a roadmap in support of President Obama’s goal to double U.S. energy productivity by 2030. The report lays out a path businesses, state and local governments, consumers and others can use. Building on the U.S. DOE’s Quadrennial Energy Review installment released earlier this year, U.S. Senate democrats released a tax reform proposal that aims to early on address U.S. energy challenges predicted in the report. A recent Rutgers University assessment on bioenergy potential in New Jersey found that the state producers over 7 million dry tons of biomass annually, over 4 million of which could be recovered and used to generate power, heat or vehicle fuel. This month, the U.S. DOE released its second Quadrennial Technology Review. The report examines the current status of clean energy technologies, identifying clean energy research opportunities for the power sector. The International Energy Agency recently released its annual Medium-Term Renewable Energy Market Report at a Group of 20 leaders’ meeting in Turkey. The report forecasts global market trends and developments for renewable energy and biofuels to 2020.